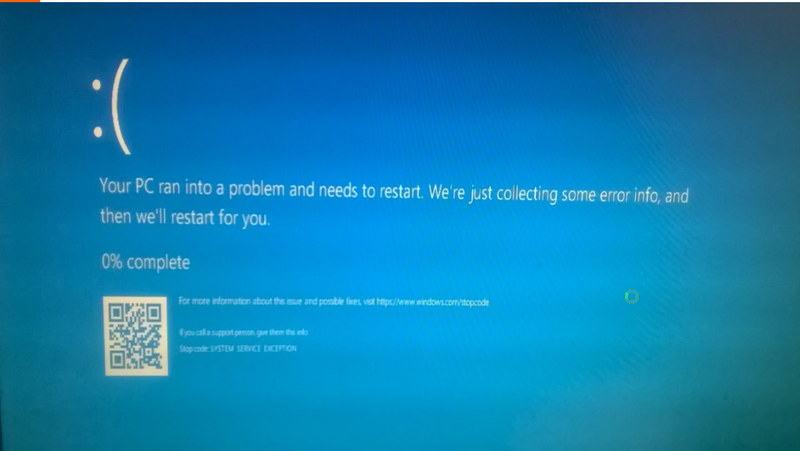 Wednesday wake up was terrible, had to finally reboot after black screen with mouse pointer. The ability to remove these apps doesn't really mean much in terms of disk space or convenience, as none of them are very big. The move may be of more interest to corporate deployments; an organization that has standardized on Outlook, for example, might want to remove the Mail and Calendar apps to reduce user confusion. The problem with Windows as a Service is quality. Previous issues with the feature and security updates have already shaken confidence in Microsoft's updating policy for Windows 10. 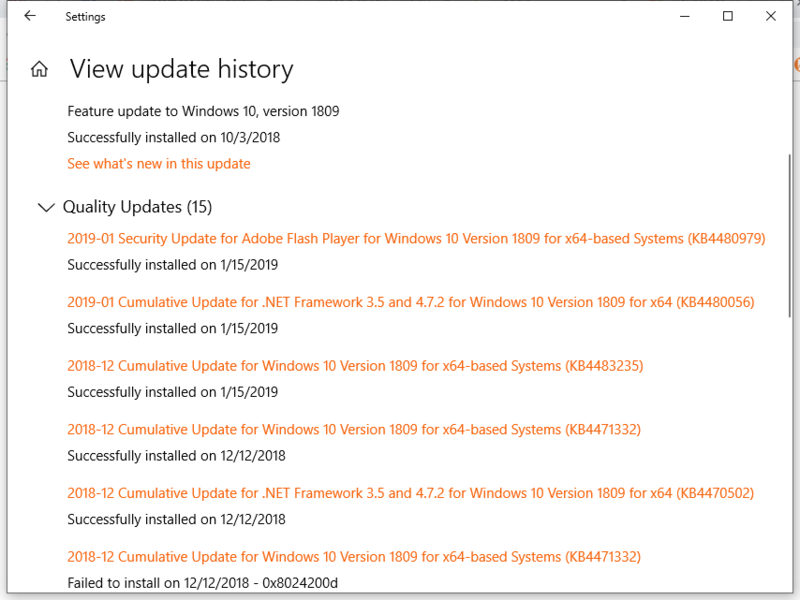 While data is notably lacking, there is at the very least a popular perception that the quality of the monthly security updates has taken a dive with Windows 10 and that installation of the twice-annual feature updates as soon as they're available is madness. These complaints are long-standing, too. The unreliable updates have been a cause for concern since shortly after Windows 10's release. YET Microsoft sure knows how to slow down Chrome! NEXT computer will be LINUX! Had enough of this crap! Speaking of Windows 10 in S Mode, which Microsoft has been working to get OEMs to ship on PCs -- especially Always Connected ones -- there will be a new requirement in Windows 10 1809 (the October Update) for Windows 10 Pro in S Mode devices. Devices running Pro in S Mode will be required to have Internet Connectivity as an out-of-the-box requirement, and will require users to log in with Azure Active Directory if those devices are enrolled in AutoPilot, as officials noted at the Microsoft Ignite IT pro conference. A bug in Windows 10 allowed UWP (Universal Windows Platform) apps to have access to the entire file system in Windows without permission from the user. This could have allowed a malicious app to access any data stored on the computer without the knowledge or consent of the user. These Linux distros additionally can be installed manually using the Windows Console command-line interface, Microsoft's announcement indicated. Windows 10 users are stating that when they try to change the default program used to open a particular file extension, such as .txt files, they are unable to associate it with popular Notepad replacements such as Notepad++. On the other hand, they have no problem changing the file association to a different one. Several days later, Microsoft pulled that release from its update servers and took the unprecedented step of also removing the installation files from its download servers. 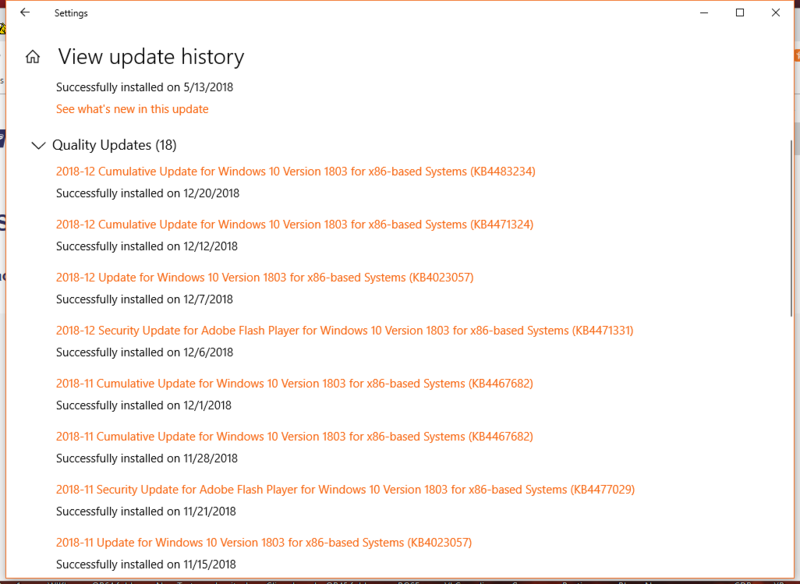 At that time, the company revised the text on Update History page to include this note: "We have paused the rollout of the Windows 10 October 2018 Update (version 1809)* for all users as we investigate isolated reports of users missing some files after updating." 1. Right click the Start menu and click Device Manager in drop down menu list. 6. Check your driver version. If the driver version is listed as either 24.20.100.6344, or 24.20.100.6345, your system is affected by this issue. Please contact Microsoft support for a resolution. Once you’ve confirmed your device has the incompatible driver, please contact Microsoft support directly at 1-800-MICROSOFT or find a local number in your area. The important data loss bug that interrupted the rollout of the Windows 10 October 2018 Update, version 1809, may be fixed, but it turns out there are plenty of other weird problems with the release. Chrome browser still needs to be closed and reopened on laptop when slow (2-3 days). Serious problems with Chrome on 32 bit laptop after update! Have had to close it every day since update to get it to run well. Slows computer down too at times. Could RuntimeBroker be limiting Chrome browser efficiency? 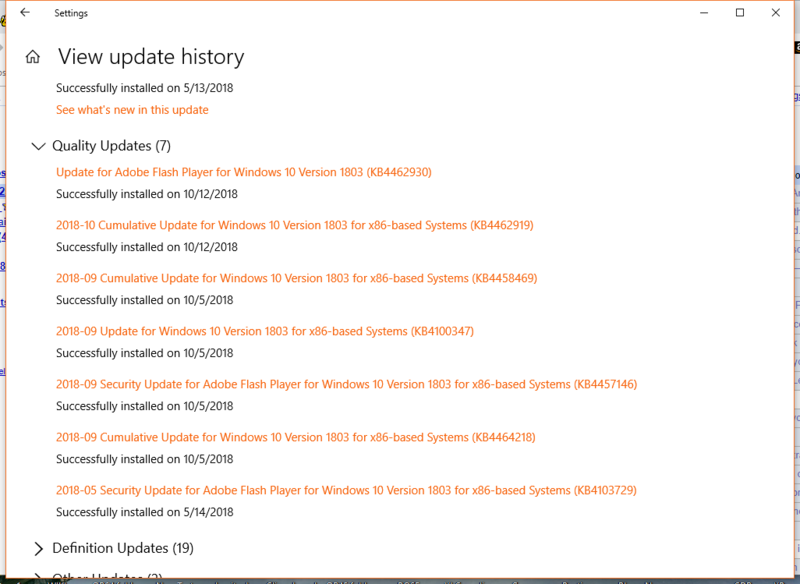 WUSHOWHIDE no longer seems to find updates to hide, just Silverlight and Adobe security updates. And on top of all that, there are some new keyboard shortcuts: Ctrl-Shift-N to open a new Notepad window from within Notepad, Ctrl-Shift-S to Save As..., and Ctrl-W to close the current window. At this rate, can some kind of tabbed Notepad be far behind? And perhaps more usefully, Notepad has been updated to work with paths longer than 260 characters. 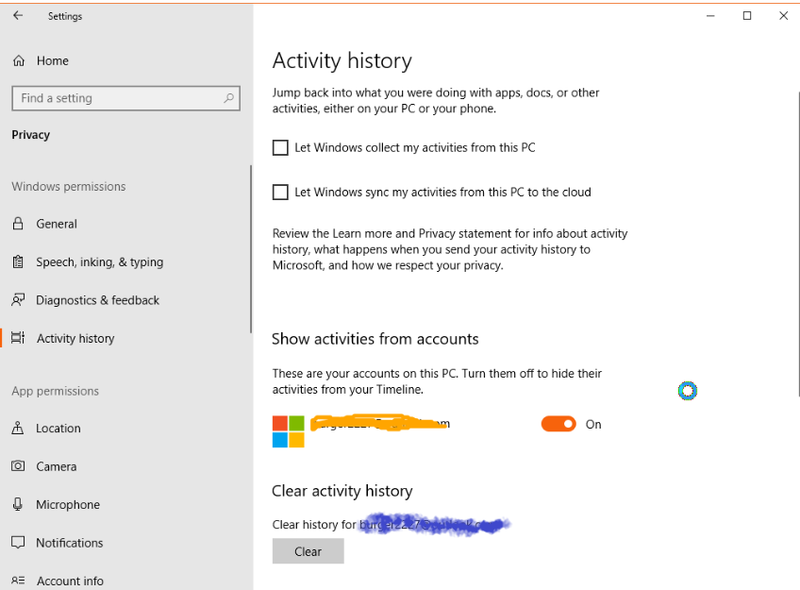 1) Under Settings -> Privacy -> Activity history, make sure that “Let Windows sync my activities from this PC to the cloud” is not checked. 2) Under Settings -> Privacy -> Diagnostics & feedback, make sure that Diagnostic data is set to “Basic” (when set to “Full,” information about websites you browse is sent to Microsoft). We made the test on one of our PCs this morning, and no web browsing data has been collected so far. In the end, the problem seems to be that turning everything off in “Activity History” doesn’t actually turn everything off, and privacy-conscious users currently have to look elsewhere to completely disable sharing Windows 10 apps and services Activity History with Microsoft. The company may well be committed to customer privacy, but this is another case where the execution could probably be much better. "The intent of these releases is to provide visibility into, and enable testing of, the non-security fixes that will be included in the next Update Tuesday release." However, some of the onus also falls on Microsoft. Since Edge is coupled with the Windows 10 operating system, major updates to the browser only come twice a year. Competing browsers like Chrome and Firefox are updated on a much more frequent basis, with the latter being better insulated from any perceived Google trickery. For its part, the move to Chromium will allow Microsoft to decouple Edge from Windows 10 and update it more frequently. What's interesting about this whole situation is that Microsoft Edge really isn't even a threat to Chrome's browser dominance (and neither is Firefox). Edge never became the dominant force in the browser market that Microsoft hoped it would be -- even though it's the default web browser in Windows 10. Or if we look at it from a more suspicious eye, maybe the reason that Edge hasn't been more popular is exactly because of these alleged Google tactics (something that Microsoft knows a thing or two about from its own past transgressions). A reactivated built-in Administrator account will be automatically deactivated when upgrading from Windows 10 version 1803 to Windows 10 version 1809 according to a post published on Microsoft's Japanese Technet blog. "We are currently working on solving this problem, and at the moment we aim to release a patch in late January 2019," says Microsoft. "Therefore, if you need to upgrade before the patch is released, please confirm that you can surely sign in with a user with administrative privileges other than the built-in Administrator, before you upgrade." In Windows 10 Home, you can delay the update by telling the system that you’re you’re using a metered connection but this trick may not work in long run. This behaviour is about to change as the software giant is working on a new feature which can delay the updates for up to seven days. In Windows 10 19H1, or version 1903 when it's released this year, Microsoft is introducing 'reserved storage', which will keep around 7GB of disk space -- but possibly more -- available purely so that updates can be installed smoothly. Reserved storage won't be unused though. It'll be a dumping ground for temporary files that users would have to remove anyway if they've got insufficient space at the time of an update. Temporary files are automatically placed in reserved storage. Microsoft is now hard at work on the next feature update for Windows 10, codenamed 19H1 and scheduled for release this April. This update is expected to include yet more changes, new features, and further UI refinements and improvements. Microsoft is making some big changes to Cortana in Windows 10. The software giant is planning to decouple search and Cortana in the Windows 10 taskbar, allowing voice queries to be handled separately to typing in a search box to find documents and files. This change will be implemented in the next major Windows 10 update, currently scheduled for April. Windows 10 will direct you towards a built-in search experience for text queries, while Cortana will exist for voice queries instead of them both bundled together. 1803 Laptop takes up to 10 minutes to wake up enough to run any program. Microsoft announced that it would integrate Cortana with Amazon Alexa, and it finally enabled the first version of that integration last year. But Nadella confirmed that he wants to work with Google Assistant as well. Setup. 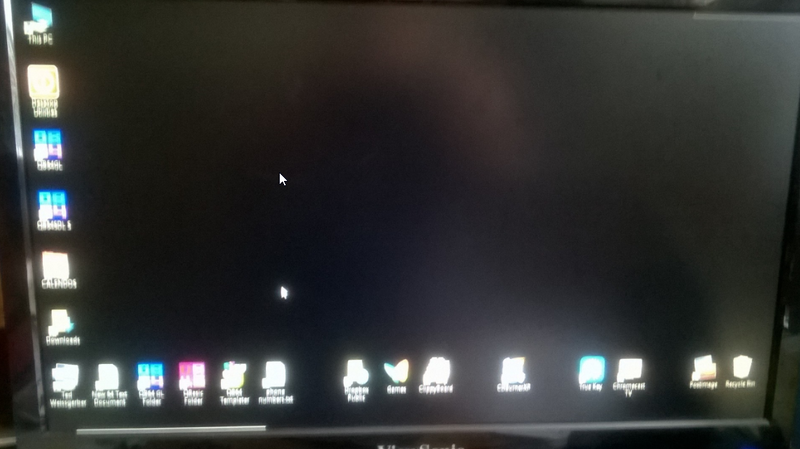 Pressed F1 and it went to Windows 10. Login password took a while to come up after several mouse clicks. 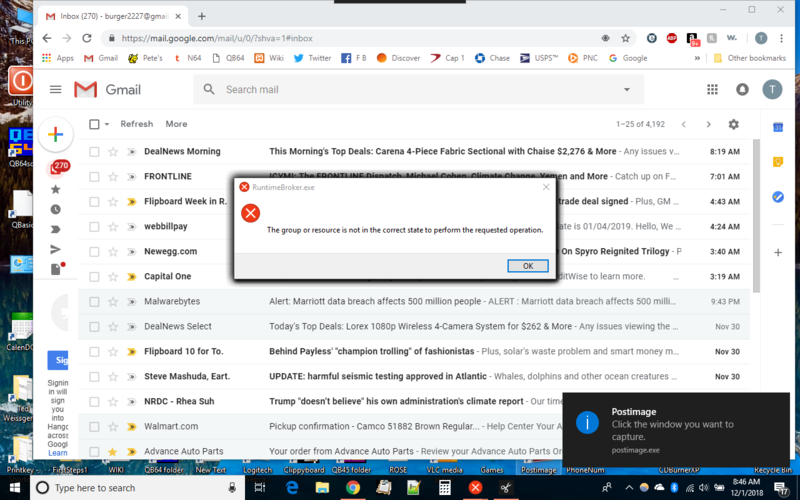 Chrome browser came up automatically like it is supposed to which it had not done on either W10 PC. Many users on outage pages and Twitter are stating that this is an ISP DNS issue. For example, users of Comcast or Xfinity reported that switching their DNS servers to Google's 8.8.8.8 DNS service solved their problems. Microsoft has finally realized that many average users have no idea what a KB and its numerical ID are and don't know what to do when they appear in a Windows 10 setup error notification. On the flipside, Office 2019 also delivers full installs of the Office apps we know and love — but they’re “frozen in time.” They don’t ever get updated with new features, and they’re not cloud-connected. Also, Office 2019 doesn’t support real-time coauthoring across apps, and it doesn’t have the amazing AI-powered capabilities that come with Office 365. The existing My Office app has many of these features, but the new Office app puts the focus on the free online versions of Office if you’re not an Office 365 subscriber. That’s something Microsoft has struggled to promote, and many consumers simply don’t know that office.com exists and Microsoft has free online versions of Word, Excel, PowerPoint, and Outlook. A number of consumers also assume Office simply comes as part of Windows, so renaming this app to Office and surfacing online versions of Office apps will certainly help there, too. You can download the new Office app from the Microsoft Store, and it’s rolling out to existing Windows 10 users over the coming weeks. New Windows 10 builds are using Xbox's infrastructure for Windows games. The State of Decay package does nonetheless contain PC-oriented elements. In particular, it tries to install and update the DirectX runtime during its setup. We the users don't seem to be at the stage of simply running Xbox games unmodified on our PCs, or at least, not yet. But it looks as if the groundwork is being laid. The strange preview of a 2020 Windows release looks like it contains even more of this infrastructure, with signs of a layer to support Xbox's Direct3D variant on PC. But will older Windows PC's like my 32 bit XP laptop be able to USE that Direct3D??? The paper’s conclusions are fairly straightforward: Users need more information about updates and more control over when they happen, and Microsoft should simply never reboot the PC to install an update when the system’s in active use. While the users polled by the study ultimately concluded that the updates have value, the study’s authors concluded that Windows did not explicitly notify users of what update it was applying (a security patch versus a feature update) and about how much time that update would take. Either way, there seems to be something of an impasse. Microsoft hasn't reverted whatever change is causing the crashes in the first place, but it has been a problem for months and is having a significant impact on the company's Windows 10 testing infrastructure. The entire testing pipeline has seized up because of this GSOD problem. 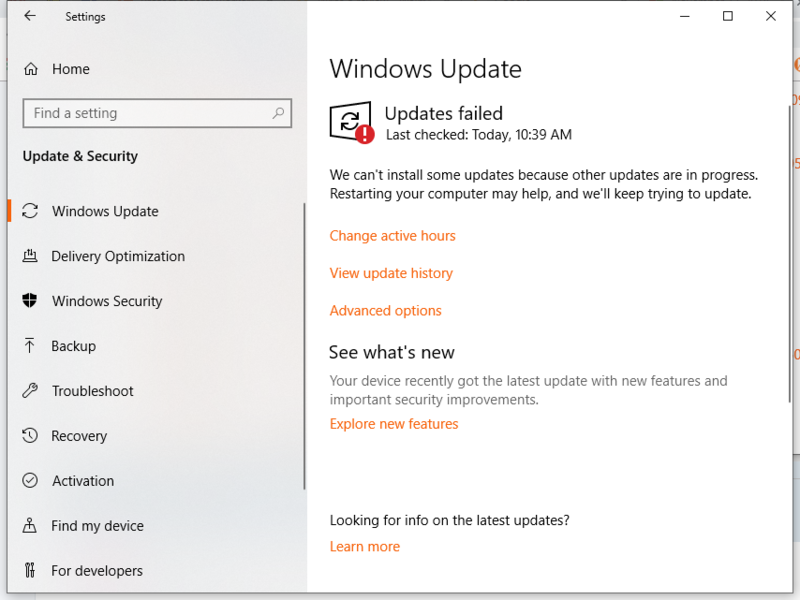 Amid concerns that Windows 10's testing already has too many gaps and leaves too many bugs unresolved, the April 2019 update is off to a rocky start, and it isn't even finished yet. Update: While the GSOD of death issue remains, Microsoft has at last pushed a build to the Slow Ring, number 18342.8. To avoid crashing machines, the build won't be offered to any system that has the offending anti-cheat software installed. It's not clear why this approach could not have been used months ago. That means, however, that Azure needs to catch up, and apparently this has shaken up the release timetable a bit. 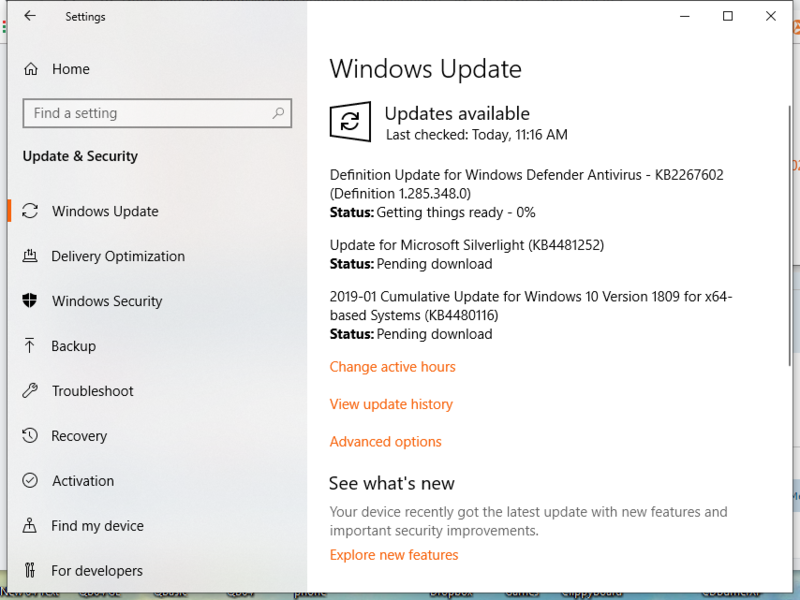 The Windows 10 April 2019 Update is almost here, built on the December 2018 internal release. Normally, that work would then be stabilized and baked into a June 2019 release, which would have been codenamed Vanadium, with that release used as the basis for Xbox, Windows, and Windows Server development in the second half of the year. But this year, the June 2019 release is being skipped. We're still going to get an October 2019 feature update, but that too will be based on the December 2018 release. The Windows core platform won't see an internal release (codenamed Vibranium) until December 2019. Microsoft might be targeting dual-screen devices initially, but the longer plan is for Windows Lite to help the company better compete against Chromebooks. Microsoft has previously tried restricting Windows 10 with an S Mode to just Microsoft Store apps, but most of the legacy of the Windows interface remains. Microsoft is now looking to ship something a lot more basic with Windows Lite and build on top of it for more complexity down the line.